While the hospitals’ authorities said that the group of relatives had forcibly tried to enter the building where the patient was admitted, her father claimed the guards had misbehaved with his wife and thrashed them with sticks when he tried to raise the issue. “A 37-year-old woman complained that the security guards thrashed her husband and assaulted her sister at the gate of the trauma centre,” Deputy Commissioner of Police (South West) Devender Arya said. “At around 3 pm, a group of people came to see the patient who is admitted on the seventh floor of the trauma centre building. 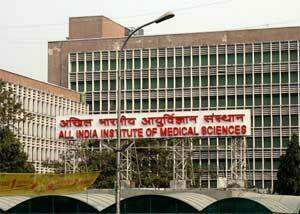 It was led by a woman and they tried to barge inside through the emergency ward,” Dr Biplab Mishra, faculty in charge of security at AIIMS Trauma Centre, said. “The security guards and special security guards tried to stop them because we allow only one or two relatives to meet the patient, but they started arguing and the woman grabbed the collar of one of the special security guards,” he said. “We called the police and meanwhile, our guards used sticks to disperse the crowd but did not beat them,” Mishra said. “One person sustained a head injury in the chaos. He was given stitches and his condition is stable. We have given a complaint to the police,” Mishra added. However, according to Asghar Ali, a former media person and a resident of Nizamuddin, his 15-year-old daughter was admitted to the hospital on Monday after she fell from their terrace. “My wife then called me and I reached the hospital. I asked them to call the people who had misbehaved with her. The guards denied it and closed the gate from inside,” he claimed. “Later, they opened the gate and started beating us with sticks. Around six to seven people got hurt. I sustained a head injury and my shoulder bone was broken,” Ali said, adding they had filed a complaint against the hospital guards.